The story of Long Term Capital Management, a hedge fund that collapsed dramatically in 1998, is instructive to anyone with an interest in modern finance. 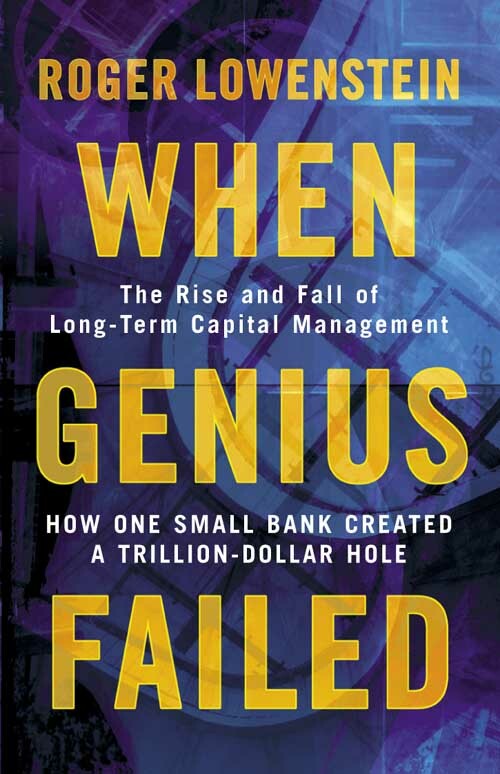 Roger Lowenstein gives the definitive account of the rise and fall of LTCM in his book ‘When Genius Failed’, now part of the business-lit canon. When it was founded in 1994 LTCM was notable for the outstanding pedigree of its partners, a mixture of experienced traders and renowned academics, including Myron Scholes and Robert Merton, two professors who helped invent option pricing theory and would later share a Nobel Prize. The premise was simple: they would identify small anomalies in bond prices, then make massively leveraged bets that the anomalies would disappear. Relying on economic theory and past data on market movements they could identify theoretical mis-pricing in the market and profit from the correction in market prices. Until recently it was expected that powerful governments would never default on their debt. This belief was eroded by various crises, and in the mid-nineties the conventional wisdom was only that nuclear powers would never default. LTCM expected this to hold and was seriously caught out when Russia stopped paying its creditors in 1998. Nowadays it is accepted that even developed nations may default (they have simply accumulated so much debt), but nevertheless the US Government is still considered a ‘risk-free’ borrower. The concept of the ‘risk-free rate’ indeed lies at the heart of the equations used for investment decisions – so accepting that there is no such thing would require a new ‘relativistic’ framework at the heart of finance. With the US deficit out of control and its politics in paralysis, maybe the invention/adoption of a new framework is overdue. While it is generally accepted that markets stray from being efficient in the short run, many economists still believe that in the long run prices always converge with intrinsic values. Many investors, including LTCM, base their investment decisions on this assumption. In LTCM’s case, it served them well for several years – but backfired massively in 1998 when prices became more volatile than any of the ‘fundamentals’ would suggest they should have. Instead of cutting their losses when markets moved against them, the managers of LTCM were so confident that they increased their positions. The ‘Efficient Long-Run’ is a dangerous myth, and while many academics recognise this (and are working out why prices move irrationally) it is a myth that endures. Finance theory is based on the perspective of a small investor whose individual actions do not affect market behaviour. One corollary of this is that there will always be a buyer for one’s assets, at the market price. LTCM was a long way from this theoretical ideal. With over $100bn in assets placed on a fairly small number of trades, it was like a whale in a swimming pool: the slightest move could make waves in the markets. It entered into trades so large that it could not exit them without prices in the market dropping. When liquidity in its markets (mostly exotic derivatives) dried up, it was left with no means of ‘cutting its losses’ on losing trades. Perhaps astoundingly, these assumptions are still widely believed and still guide much of the financial industry and government policy. The implosion of LTCM should have been a wake-up call, but instead it was patched up and things returned to business-as-usual, sowing the seeds for the 2008-09 financial crisis. Many prominent investors and academics have been openly questioning these assumptions for decades (Soros, Buffett, Stiglitz and Shiller to name a few) but as yet the core of the finance establishment is yet to change. Perhaps the absence of a convincing and functional alternative theory is holding back change? Perhaps, herein lies an opportunity to come up with something new?